The CHU Sainte-Justine has a critical mass of 250 rehabilitation professionals and 15 researchers in the fields of musculoskeletal disorders and rehabilitation. Their goal is to heal whenever possible and to improve the prospects for life and independence of those children whose disease is irreversible. Advances in the fields of musculoskeletal disorders and rehabilitation require extensive multidisciplinary collaboration in medicine and technology. Such progress also requires being able to ensure better continuous treatment over the long term, which means developing and implementing the appropriate rehabilitation measures from the outset of treatment. The CHU Sainte-Justine has therefore done everything it can to revolutionize rehabilitation care, acquire state-of-the-art surgical equipment and build one-of-a-kind teams of experts to make continuous improvements to this equipment and give new impetus to basic research. 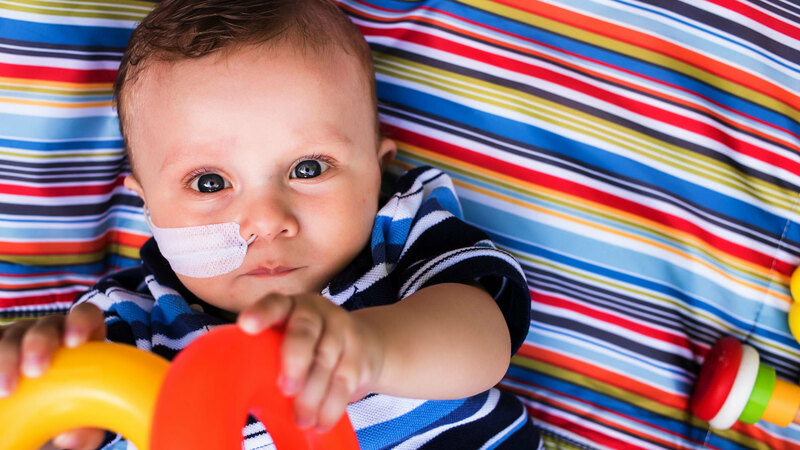 The Pediatric Rehabilitation Technology Park seeks to take full advantage of the critical mass of professionals, researchers and patients at the Marie Enfant Rehabilitation Centre. The vision of the Pediatric Rehabilitation Technology Park is to bring together players in research, teaching and clinical services to strengthen a multidisciplinary approach to rehabilitation—engineering, orthopedics, physical therapy, occupational therapy, neuroscience and more—and establish a lasting partnership between specialized technology R&D companies and health care. The technology park makes it possible to nurture the ambition—unthinkable just yesterday—to redefine the meaning of rehabilitation, by spurring research in regenerative therapy involving stem cells and genomics. It opens up the prospect of a better quality of life for children grappling with acute medical problems, genetic disorders, chronic conditions or trauma, as well as those who have survived accidents or premature birth. 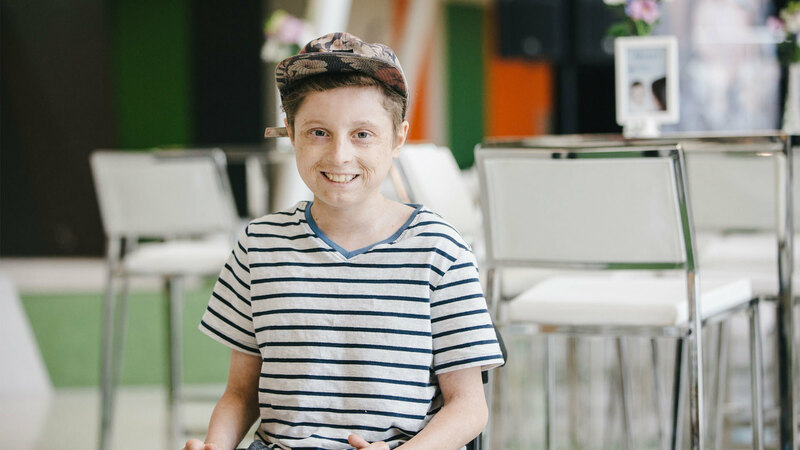 I’m happy, because the fact that my growth modulation worked so well means it will help other kids who have the same operation. 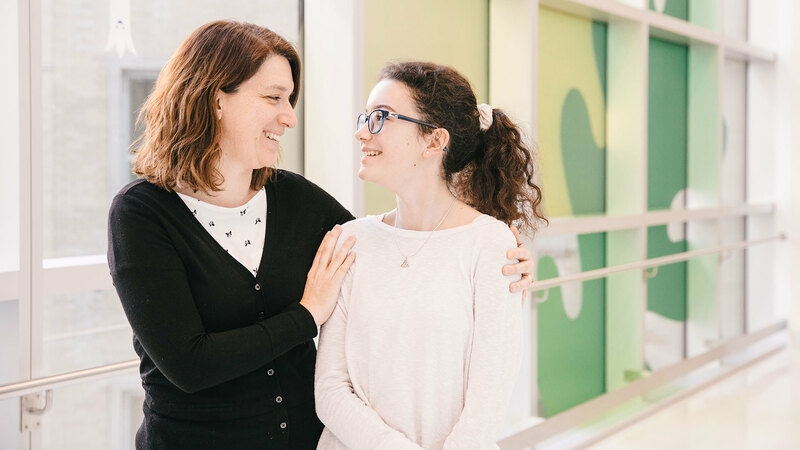 Mathilde saw Dr. Stefan Parent, an orthopedic surgeon at the CHU Sainte-Justine, after developing severe scoliosis in the wake of a very rapid growth spurt. Fortunately, she was a perfect candidate for an avant-garde surgical procedure performed by Dr. Parent and his team: growth modulation. “It’s as if they stapled some of my vertebrae to straighten out my spine,” explained Mathilde. 4,000 cases of scoliosis are seen each year at the CHU Sainte-Justine. 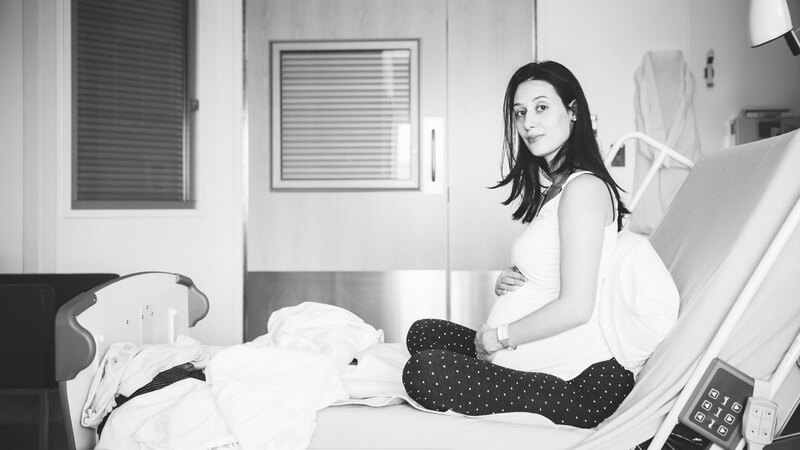 25 to 30 patients are candidates for the growth modulation procedure. 100 patients have benefited from this revolutionary technique since 2015. The new technique greatly reduces the pain and recovery time in comparison with conventional surgery, which consists of fusing vertebrae and immobilizing them between two metal rods. 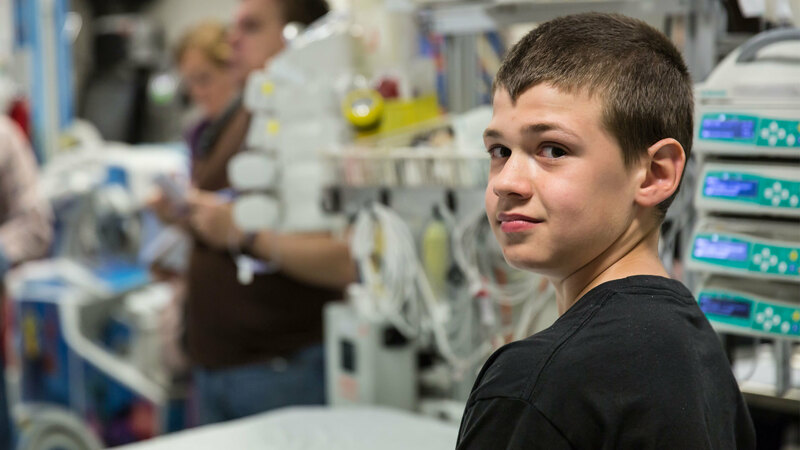 In just a few days, patients are back on their feet and less than a month later, they can return to their everyday activities! 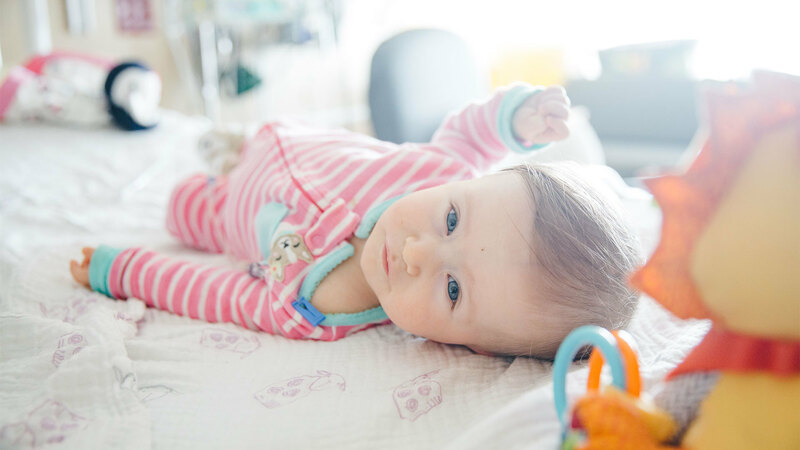 Even before her operation, Mathilde could see the possible results on her spine. Thanks to their combined efforts, experienced engineers and the Sainte-Justine team developed an innovative spine-modelling tool. It not only provides a 3D visualization of the spine, but also predicts the effects of growth modulation on the patient. 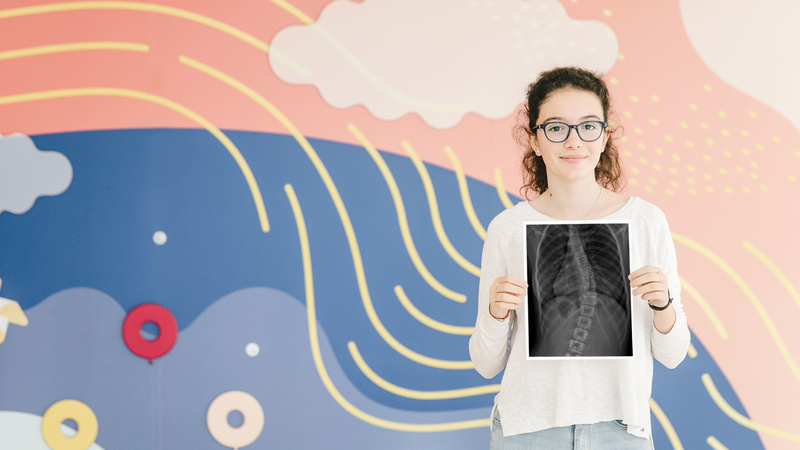 The results of her operation were phenomenal: within barely a few hours, the deviation of her spine went from 45 degrees to 15 degrees, and just a few months later, her scoliosis had totally disappeared. Today she’s marching straight into the future. The CHU Sainte-Justine Foundation's Mélio Fund – formerly the Fondation Mélio – is an essential pillar of support for the centre of excellence in musculoskeletal disorders and in rehabilitation medicine. It is dedicated to providing ongoing and indispensable support for the 5,000 children with locomotor or speech impairments being cared for at the Marie Enfant Rehabilitation Centre (CRME). Mandated to take over and redistribute the assets of the Fondation Mélio, the fund was created in 2017 out of a shared desire by the teams to consolidate their efforts in order to have an ever-increasing impact in the lives of the children of the CRME and their families. financing the creation, planning and development of specialized services at Sainte-Justine’s Marie Enfant Rehabilitation Centre.